On a stormy Saturday evening we walked down Barkly St, looking for a fine Indian restaurant called 'Tandoori Flames.' As we continued along from middle Footscray, it dawned on us that we might be looking for a lonely Indian restaurant in the heart of the West. However, we were relieved and excited when we discovered a small shopping strip in West Footscray. We found the restaurant tucked among numerous lit up restaurants and cafes, most of which were mainly serving Indian cuisine. The restaurant was decked out comfortably, with welcoming leather benches alongside the walls, dark wooden tables and a bar down the back. Initially the music that filled the room created a relaxed ambience. It wasn't a small space – and come 8pm the restaurant started to fill up with groups of local friends and families sharing meals and beverages. To the menu: there's a strong vegetarian section: plenty of paneer, vegetable curries; korma, masala and the like for mains. From the poultry farm choose from 11 dishes including the classic butter chicken, madran, vindaloo, korma, murg punjabi or chicken chetinah; an authentic South Indian dish. From the country side, there is also a range of lamb, beef and goat curries, with the lamb chop masala as the chef's recommedation. 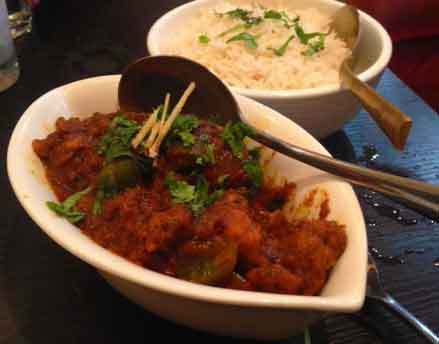 A choice of six fish or prawn curries is on the menu, and for those who prefer less intense dishes there is an Indo-Chinese menu containing manchurian dishes, garlic chicken and even fried rice. The entrees are a mix of meat and vegetarian dishes, with more than samosas available. We opted for the dahi bhalla chaat, a sweet and sour Indian street food snack with fried dough served with yogurt ($6.90). The delicious starter was heavily relished with the sweet green chutney, minted yogurt and spices. Alongside this, a dish of delicate vegetable parcels (described as dahi puri chat). The round, hard, puffy puri shell were slightly broken on top and partially filled with the vegetable stuffing, seasoned with spice and sweet chutney and spicy green chutney. A pot of broth on the side, spooned into the parcel lifted the spiciness of the dish. One regretful decision I made whilst at this restaurant was to not sample from Tandoori Flame's charcoal fired clay oven. From Tandoori mushrooms, chicken and prawns to tikka and lamb chops cooked in a Tandoor, these sizzling plates are a testimony to the restaurant's name. The beverage list is extensive, with wine, beer and affordable cocktails, so a Pina Colada was definitely on the cards for me. 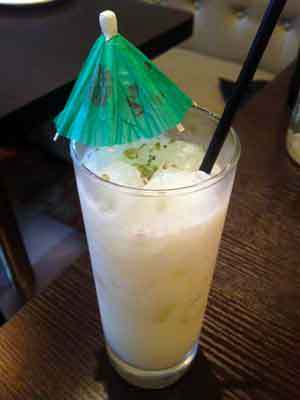 With its intense coconut flavour and Indian spice, it was the best Pina Colada I've had outside of Hawaii. There are some interesting-sounding dishes in the main menu, such as goat masala and goan fish curry. However I was drawn to the chef's recommendation - prawn Malabar which is described as "tiger prawns cooked with coconut, mustard seeds and curry leaves" came out at the same time. Having ordered mild, this strong earthy coloured curry was flavoursome and packed a bit of a punch for mild and the small prawns were cooked perfectly. The waiter, who was exquisitely well mannered but somewhat busy tending to the entire restaurant, asked how we'd like our curries – mild, medium or hot. I picked mild for the malabar and my partner chose medium for the bhuna chicken. There was a nice heat to the mild and the medium was described to me as 'quite hot but not overpowering'. The bhuna chicken and starters we enjoyed were not on the take away menu; the variety when dining-in is copious. A couple of baskets of soft and fluffy fried garlic naan bread ($3.00 each) helped soak up all the curry. We were working our way through the meal with full bellies when we noticed more and more customers come in to dine and order take away. The music also become more upbeat as the restaurant holds belly dancing in-house every Friday & Saturday night. There are a couple of desserts such as pan kulfi (ice cream made with pan leaves and rose petals, $6.90) and gulab jamuns ($4.50) but we had stuffed ourselves with so much naan and curry that we called it a night in West Footscray. 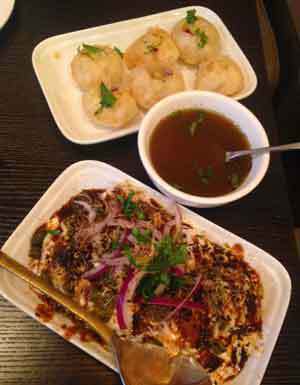 The fully licensed and BYO restaurant with its extensive menu is one of the best Indian restaurants I have had the pleasure of eating at in Melbourne. The food was presented exceptionally well, the service was beautifully polite and the food and cocktails were full of flavour and passion.